What is a Jook Joint? 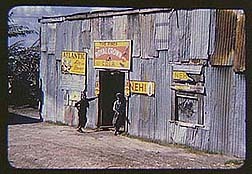 In the process of studying FSA photographs from Florida, I came across Marion Post Wolcott's images of jook joints. Although not all the photographs of jooks in the FSA file are from Florida, a majority are, and Wolcott is responsible for most of them. At first, I stopped and paid attention because I found them visually intriguing. As I spent more time working with them, I decided they would provide rich material, a good lens through which to work out some of the theoretical issues that were surfacing as I considered the work of the FSA as a whole. I actually got to the point where I was starting to write about the images before I realized that I really didn't know anything about Belle Glade, the area where all these jook joints flourished. The FWP guidebook was sitting right above me on my shelf. As an in-depth source on the Florida landscape of the 1930s, it was the first place I looked to try to figure out what the Belle Glade of Marion Post Wolcott's time was like. Though I didn't notice at the time, this was the first moment that I turned to the book not as a historical specimen but as a reference source, as it was intended to be used, as a contemporary audience would have read it. In the course of reading up on Belle Glade, I became fascinated with the way the guidebook talked about the area and about jook joints, and a whole new line of inquiry opened up. I turned more and more to contemporary sources to see if I could trace some of the discursive patterns I first recognized in the projects of the FWP. As this material has come together, an interface has developed, I think, between formal analysis of the photographs and background research on their context. As a whole, this section on jook joints has provided a synthesis for me between the two major sources for my project; the FSA photographs and the writing of the FWP. I hope that all of this project seems coherently connected. But I know that this section, where I most closely work back and forth between the two sources, is where the fusion can really happen. 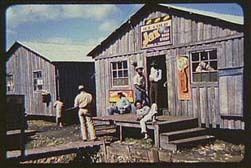 There are three main sections here of material about jook joints; FSA photographs of Florida jooks, taken by Wolcott, the history of Belle Glade, and some cultural background on jook joints. There is no suggested order for these sections, you can move in between them as you like. - You can figure out what a jook joint is anyway, and what kind of issues are at play in public representations of them.